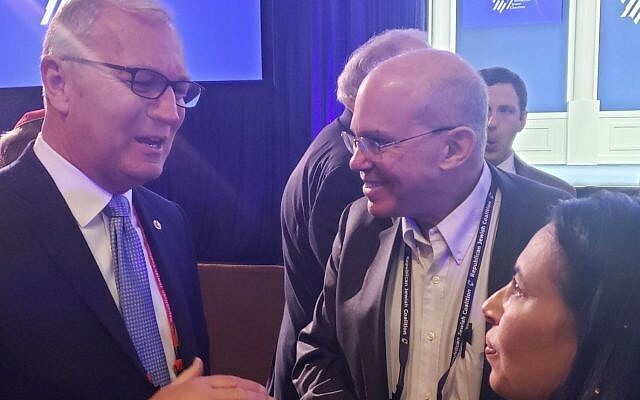 LAS VEGAS (JTA) — Three Republican senators introduced a resolution that recognizes Israeli Americans as a class that deserves protections against discrimination. The resolution is the result of work by the Israeli-American Civic Action Network, a relatively young group that reflects the increased activism of Israeli Americans acting and lobbying independently from the organized Jewish-American community. It plans to lobby senators from both parties to pass the non-binding resolution. The Israeli-American Coalition for Action, the sister advocacy organization of the Israeli-American Council, originally initiated this legislation. The RJC helped Cramer in the last election, running ads against the Democratic incumbent, Heidi Heitkamp. A major funder of the RJC and the Israeli-American Council is Sheldon Adelson; the RJC annual event takes place at Adelson’s Venetian casino resort.